Industrial Process Scale-up: A Practical Innovation Guide from Idea to Commercial Implementation, Second Edition helps industrial process innovators in research, development and commercial start-ups assess the risks of commercial-scale implementation, also providing them with practical guidelines and methods to reduce the risks to acceptable levels. In addition, the book can be used in cooperation with industrial R&D people and academic researchers to shape open innovation programs, and in education as a reference book. This updated edition has the latest literature and has been expanded with a scale-up of pharmaceutical processes and their history in both academia and the process industries. 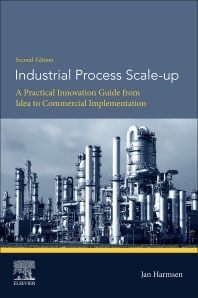 Jan Harmsen, Industrial Process Scale-up: A practical innovation guide from idea to commercial implementation, Elsevier, (2013), ISBN 9780444627261. Gerald Jonker and Jan Harmsen, Engineering for Sustainability. A practical guide for sustainable design, Elsevier, (2012), ISBN 9780444538468.